Republican states have been changing their laws to make it harder to vote – now activists are challenging those laws, and yesterday Attorney General Eric Holder finally suggested he might enforce the laws the prohibit discrimation in voting, especially when they target minority voters – ARI BERMAN of The Nation will report. Plus: blacks and guns in America. 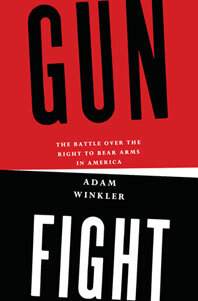 ADAM WINKLER looks at the twisted history of guns and gun control in the US. Today it’s the left that wants gun control, but for most of American history gun control was the program of conservative whites who wanted to keep guns out of the hands of black people. Adam is professor of constitutional law at UCLA; his new book is GUNFIGHT: The Battle of the Right to Bear Arms in America.